Balconies are small enclosed platforms, open at the top, that project from buildings. Those who live in apartments, condominiums and high rise buildings have to deal with economies of space and size when it comes to growing plants and flowers. Every sunny inch can accommodate container gardens, especially on balconies. Although roses won't do well in a balcony environment, a surprisingly wide variety of plants are suited to balcony container gardening, especially trailing and cascading plants. Trailing flowers grow along vines and pendulous branches and lend an air of beauty and opulence to any space. Planted in railing boxes and hanging baskets, flowers grow nicely in the open air and full sun on balconies. Morning glories, trailing petunias, lantana, ivy geraniums, verbena, lobelia, nasturtium, fuschia and canary creeper are all trailing, cascading flowering plants. Flowers grown on balconies require deadheading to continue blooming and stay attractive. For large balconies with large containers, trailing vines such as wisteria and trumpet vine produce lush green growth and large blooms. Green plants with a trailing growth habit make attractive balcony plants to grow over and down a railing. Sweet potato vines are available in lime green, purplish/black and variegated varieties that produce lush growth with large, heart-shaped leaves. Vinca is a small-leaved trailing plant with green or variegated leaves that is an attractive accompaniment for large flowers such as geraniums. Wandering jew plants produce long trailing branches. Trailing succulents and cacti are easy-to-care-for plants for a hot, dry location. Use potting soil mixed with sand or a special potting mix for cactus and succulents, and keep a watering log to avoid overwatering. Trailing aloe vera, Easter cactus, hoyas, ice plants and any variety of rhipsalis and crassula flow over the sides of planter boxes and hanging planters. Many varieties of sedums have trailing growth habits and produce thick hanging foliage. 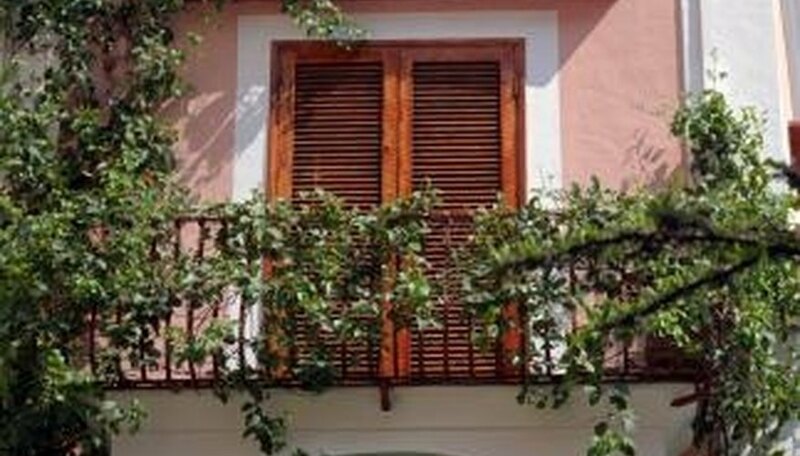 Many vegetables are suited for a balcony growing environment. Cucumbers and gherkins trail either up or down, depending on where the container is located -- on the floor with a trellis for vertical growth or attached to the building at 4 or 5 feet high to trail down. Tomatoes will trail down if their containers are angled. Cherry tomatoes are especially easy to train this way. Runner beans will grow along and over railings and cascade down the other side.